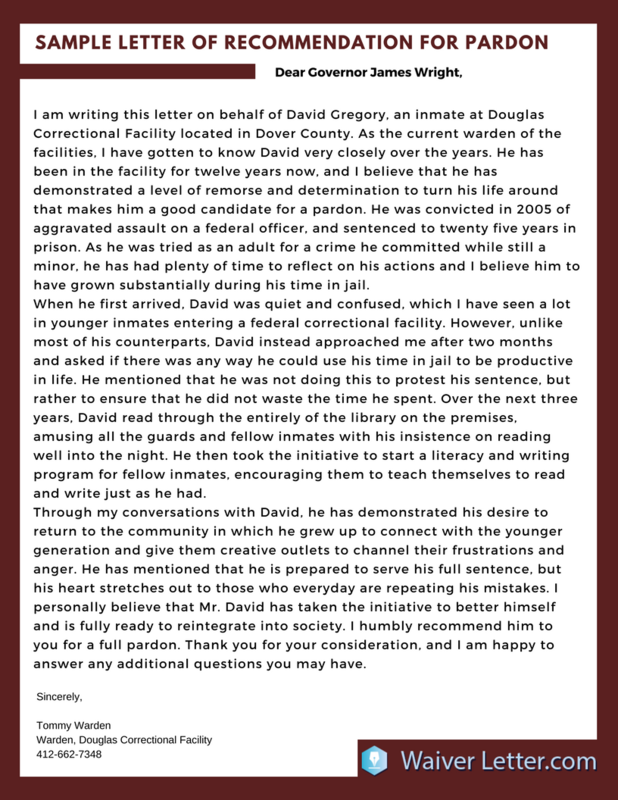 If your search for the pardon letter writing instructions and recommendations on the web you’ll find out that 90% of internet sources are uncovering the topic of jail pardon letter, whereas it is far not the least role in this kind of letter it actually can bring a lot of benefits in the other spheres of life, just like the waiver letter for any purpose. The power of the proper letter of pardon goes underestimated because people don’t even know about the existence of this letter and its functions as well. Obviously, the Wikipedia does not provide us with the full definition of the pardon letter, mentioning only the one that is aimed for the convicts, in this article we are intended to give you the total insight into the topic, provide you with right kinds of it and definitions. What is a pardon letter definition? A pardon letter is a type of official letter that is written to the particular institution (where you want to restore your rights), the pardon letter is written as a part of an application, along with supporting documents that the institution deems relevant. 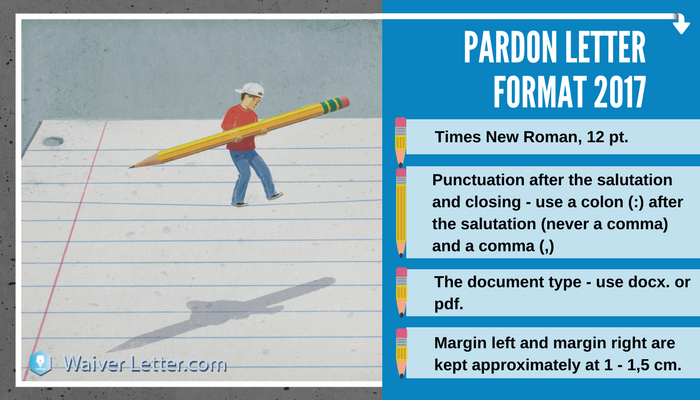 What is a character reference letter for pardon? What’s the proper way to write an excuse letter? How do I write an apology letter? What are some examples of extreme hardship letters for immigration? What is the best way to write a hardship letter for immigration? The document type – it is better to use docx. or pdf. formats, other formats such as odt. rtf., etc. are considered inappropriate because on some computers they are not supported. Margin-left and margin-right are kept approximately at 1 – 1,5 cm. The detailed measurements you can find in the sample, at the bottom of the page of Purdue Online Writing Lab. Pardon letters could be tricky at times, you need to establish the reason why you can be pardoned in the most persuasive way. There are no specific requirements for such letter writing, the requirements for the facts and the proofs and the documents will depend on the jurisdiction in which the person is seeking a pardon or the immigration regulations of the country. As the pardon letter belongs to the official type of letters it could be easily written in the business letter format, featuring the business language and the business letter formatting. Find out what kind of information should be gathered and mentioned in your letter: proofs, documents, details, facts – all that can contribute to the positive decision, in the end, such information could be asked for in the institution (the representative) or on the site of the institution. Check or ask for your eligibility or whether you have the right to apply for such application as well. Support all your statements with facts. The chances are high someone before you already wrote the letter of the type you need so it’s a better idea to dig for the samples and the examples that you can find on the web. When drafting stick to the writing format mentioned by the institution, if such are not provided keep to the rules of the official business letter writing. Start by writing your name and place of residence, after state clearly and shortly the reason for the pardon letter application. 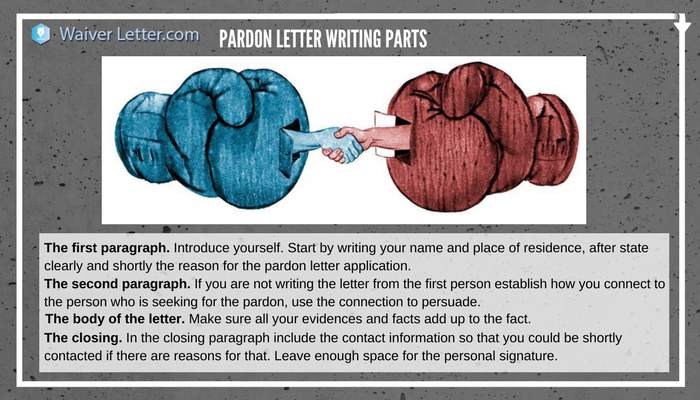 If you are not writing the letter from the first person establish how you connect to the person who is seeking for the pardon, use the connection to persuade why on your point of view the person subject of the letter should be granted a pardon. As a rule, the body consists of 2-4 paragraphs, just like in the GRE waiver request letter. Make sure all your evidence and facts add up to the fact, for instance, the fact that you are an old friend of the person does not relevant if the person is seeking the pardon because of the job finding difficulty, but if you are a former employer it could be a valuable characteristic. In the closing paragraph include the contact information so that you could be shortly contacted if there are reasons for that. Leave enough space for the personal signature made by hand. Keep in mind that the letter of pardon should also be signed in front of a notary as it provides your identity as the signer of the document. Using the wrong formatting requirements in case they have been provided by the institution. The writing specifics will be different for different spheres but the one universal aim for them will be providing the pardon for the particular institution. Immigration pardon letter. Writing the immigration pardon letter will require you to mention the reasons such as health state problems or the financial hardships like described in the featuring sample. Immigration hardship letter for a friend is written to deliver the reasons why your friend needs to immigrate. Talking about the character of your friend is only a part of such letter writing. Depending on the situation you might consider relevant to describe your friend’s family ties, for some countries they are really important for the people seeking citizenships. Focus on the hardships that your friend experiences and in which way they could be solved with the immigration. Note that the examples that you deliver considering your friend’s case for immigration should only complement your referee, represent him or her from the positive perspective, illustrate high moral standards, ethic, skills, and integrity. Pardon letter to the governor. If you are writing the pardon letter to the governor the good practice could be consulting the good lawyer to find out your eligibility first, some of them need to be written in the certain number of years after the conviction. In such a letter, you need to state the date of conviction, describe the nature of the crime and the conviction itself, again, state the reason why you think you should be pardoned. In such letters listing your or the person’s activity and the lifestyle since the conviction, such as jobs occupied, charity, ect., could be of the great benefit. Reasons for seeking a pardon you can find at official sources. Character reference pardon letter. Character reference pardon letter is a type of the pardon letter that is written by your friend to any kind of institution where he/she needs to be pardoned for something. All the abovementioned rules are applicable to this letter type, such letters are written by the person who provides the reference with the personal signature, such letter is different from the average recommendation letter because it is aimed to deal with a particular situation. Sample letter of pardon recommendation that describes the character at it’s fullest you can find in several writing blogs. Such type of application as pardon letter should be written in the manner that demonstrates that you or the person you write the recommendation for fully understand/understands the mistake, fulfilled the debt to society or have been wrongfully convicted of rules violations. 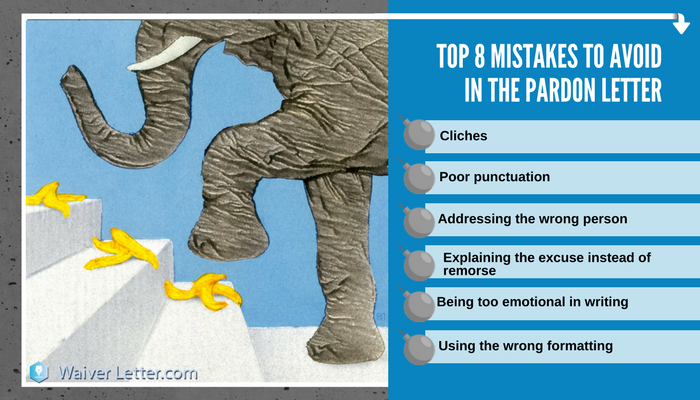 Stick to the writing regulations, keep the positive tone of writing and make sure your reasons are relevant for mentioning, only this way the writing process will pay off in the end. If you do not want the admission board to take into account your GRE® score, we can help you write a GRE waiver letter. Our team will make sure they write all the requirements and include any evidence to support your request. As some useful tips, remember to include proofs from your academic and career background, as well as arguments that will help you with your petition. If you have to take a PET, TOEFL®, IELTS®, or any other English language test, and you do not want to, we can help you write a waiver letter. We will include substantial evidence to support your English language level so the admission board can grant your request. Some useful tips you can use when writing one, are to pay extra attention to your language and grammar, as well as including certificates or evidence of your academic background. We have writers specialized in various waiver letters so they can help you write an LSAT, MCAT, GPA, GMAT, SAT, and Visa waiver letters, to name just a few. We can also help you write a pardon letter if you do not know how to write a pardon letter for immigration. 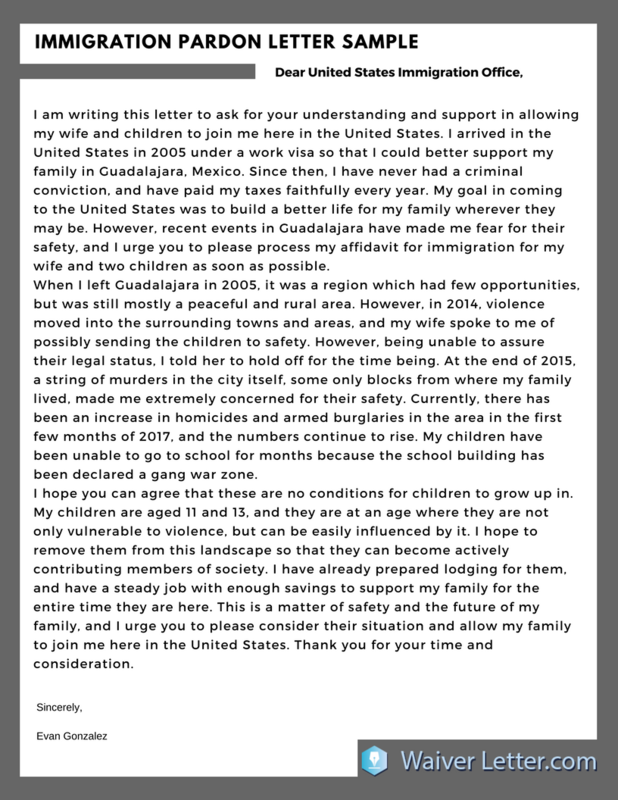 You can take a look at our pardon letter sample for immigration to get a glimpse of our work. 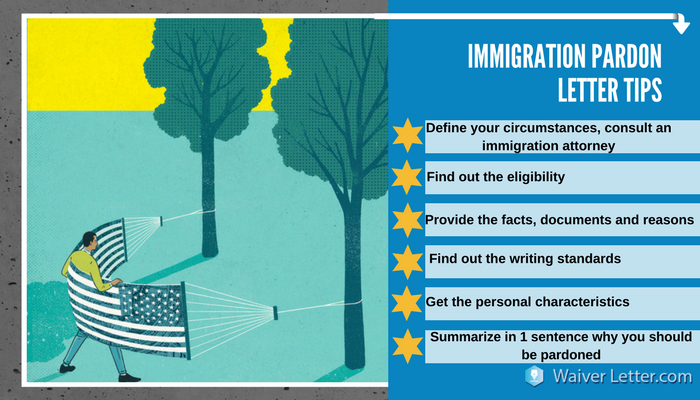 Our specialized writers can help you write an immigration pardon letter sample. Our writing and editing team can help you learn how to write a pardon letter to the governor. A well-written and well-edited forgiveness letter for immigration sample. A waiver letter that follows your requests and is written with catchy language. A friendly support team that is available 24/7. Don’t hesitate to contact us now! Write the pardon letter today – forget about future worries!